You should have an Active Internet Banking ~ MoneyClick Account. 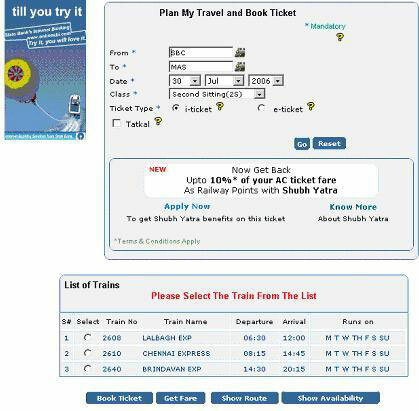 Step 1: Visit http://irctc.co.in site directly or through our website when connected through Internet. Step 2: Login with your IRCTC Username and Password. Username and Password, Free of cost. one of the passengers, who will have to carry the same ID while traveling. Step 5: CLICK on Karnataka Bank Radio button. Step 6: MoneyClick Login Screen will come. 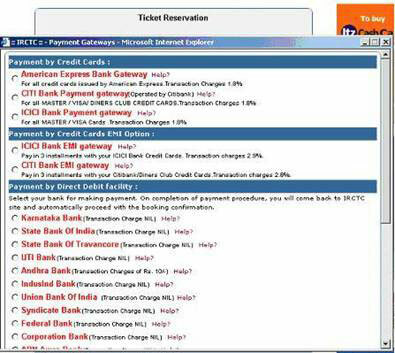 STEP 7: Amount of Ticket Booked and your Account number will be shown. Screen shots from Step 6 to till the confirmation receipt, are shown below, to assist our Constituents. 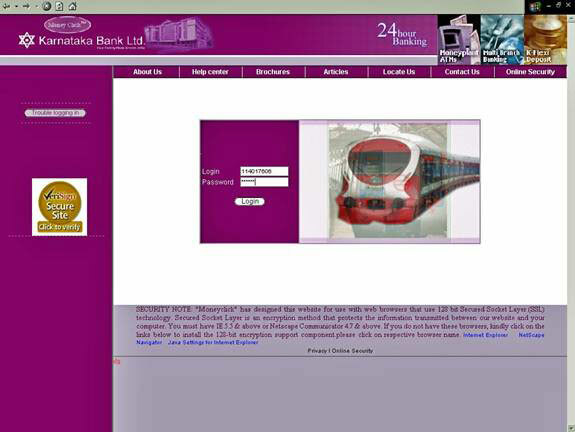 Karnataka Bank Account holders can pay IRCTC through MoneyClick Internet Banking Services. 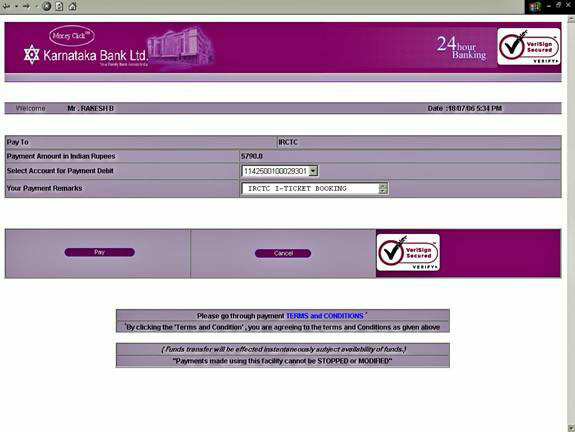 For payment, please Select MoneyClick – Karnataka Bank Internet Banking Services. 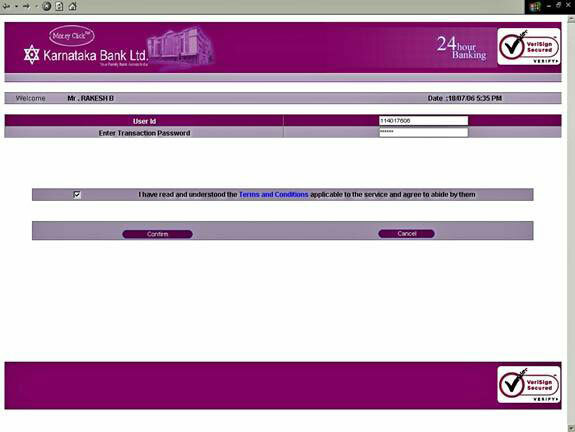 You will be taken to MoneyClick – Karnataka Bank Internet Banking Service login page as shown below where you have to enter Login ID and Login Password and press login..
Total booking amount to be paid by you will be shown. You have to select the Debit Account, to which the amount will be debited, then type remarks for this transaction for your future reference. Please go through the Terms and Conditions for payment before confirmation of the payment. If you decide to not to confirm the transaction or incase of any other problems, you may click on ‘Cancel’ to go back to IRCTC web site. 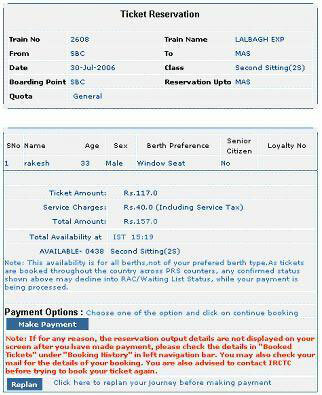 You will be redirected to IRCTC web site once the ticket Booking process is completed and the ticket confirmation screen is displayed.